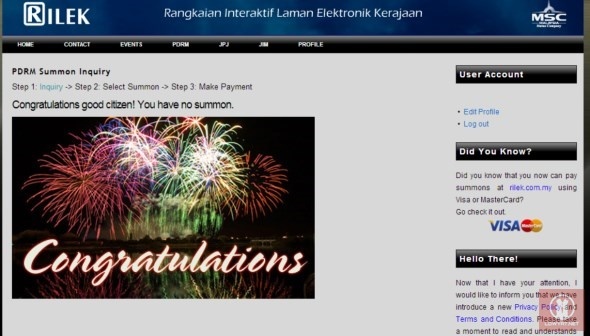 There are plenty of ways to check for PDRM summons but the search result from this particular portal – Rangkaian Interaktif Laman Elektronik Kerajaan or RILEK – is rather hilarious. As the screenshot such as above is currently making rounds in the social media, who wouldn’tbe feel proud when Batman congratulates you for being a law obedient citizen? 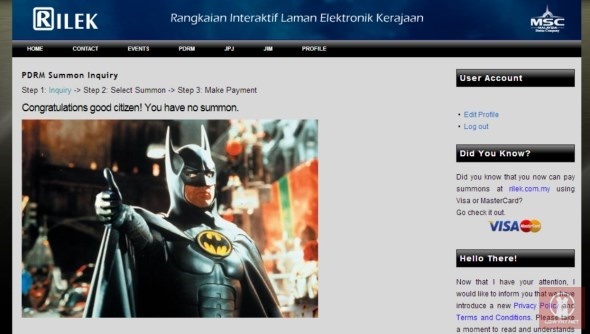 Mind you, this is actually a real and operational e-services portal. Some might thought that the screenshot is a results of Photoshop wizardry but we can assure you that it is indeed real as we actually give it a test drive ourselves. You can do it too: just register and verify your account, log into it, choose PDRM and enter your IC number. Occasionally, the result would return a picture of fireworks instead but at the time this article is published, Batman appears in our search result almost all the time.